OSHA today announced a final rule to improve protections for workers exposed to respirable silica dust. The rule will curb lung cancer, silicosis, chronic obstructive pulmonary disease and kidney disease in America's workers by limiting their exposure to respirable crystalline silica. "The previous exposure limits were outdated and did not adequately protect workers," said OSHA Assistant Secretary Dr. David Michaels. "Limiting exposure to silica dust is essential. Every year, many exposed workers not only lose their ability to work, but also to breathe. Today, we are taking action to bring worker protections into the 21st century in ways that are feasible and economical for employers to implement." About 2.3 million men and women face exposure to respirable crystalline silica in their workplaces, including two million construction workers who drill and cut materials such as concrete and stone, and 300,000 workers in operations such as brick manufacturing, foundries and hydraulic fracturing. OSHA estimates that when the final rule becomes fully effective, it will save more than 600 lives annually and prevent more than 900 new cases of silicosis – an incurable and progressive disease – each year. The agency also estimates the final rule will provide net benefits of about $7.7 billion per year. 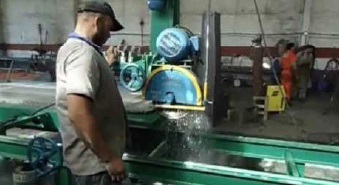 A worker cutting granite using a saw that applies water to the blade. The water reduces the amount of silica-containing dust that gets into the air. Most employers can limit harmful dust exposure by using equipment that is widely available – generally using water to keep dust from getting into the air or a ventilation system to remove it from the air. The rule provides greater compliance assistance to construction employers – many of which run small businesses – by including a table of specified controls they can follow to be in compliance. The rule also staggers compliance dates to ensure employers have sufficient time to meet its requirements. The final rule is written as two standards, one for construction and one for general industry and maritime. In addition to reducing the permissible exposure limit for crystalline silica, the rule includes employer requirements such as limiting worker exposure through work practices and engineering controls (such as water or ventilation); providing respiratory protection when controls are insufficient; training workers; limiting their access to high exposure areas and providing medical exams to highly exposed workers. For more information, see the news release—available in English and Spanish—and a blog post by U.S. Secretary of Labor Thomas E. Perez, which includes a video featuring one worker's personal experience with silicosis. Visit OSHA's silica rule webpage for factsheets, answers to frequently asked questions, and to sign up for email updates on compliance dates and resources. QuickTakes is emailed free twice monthly to more than 125,000 subscribers. You can receive it faster and easier by subscribing to the RSS feed that delivers almost instant information. Visit OSHA's RSS Feeds Web page to subscribe.